Designed for people with lower hand strength or limited dexterity, the Deluxe Trigger Release Aluminum Folding Walker with 5" Wheels by Healthline Massage Products give you the mobility, convenience and portability. Ideal for indoor and outdoor use. Stylish metallic blue & silver colors, with 1.13" diameter anodized, extruded aluminum construction, the walker can support up to 350 pounds. Features an easy trigger release for easy folding, each side operates independently to allow easy movement through narrow spaces. With strong elastic cords in back two legs, so legs can be folded, making it 1/2 the size of tradtional walker when folded. Compact and portable, easy for transport and storage, can be easily put into medium/large suitcases, trunk, cabinet... . Included 2 pairs of glide caps/skis for navigating surfaces more smoothly. Fits Most People Between: 5' - 6'4"
Width Between Handgrips (inside): 17"
Width Between Back Legs (inside): 22"
[ANTI-CRACK & EASY TRIGGER RELEASE] can be reached with hands of all sizes, allows users to close the walker without removing hands from the handle, ideal for individuals with limited finger dexterity, ensures convenience, safety and durability. [1/2 THE SIZE OF TRADITIONAL WALKER WHEN FOLDED] tool-free assembly walker with strong elastic cords in back two legs, so legs can be folded, compact for transport and storage, can be easily put into medium/large suitcases, trunk, cabinet... ideal for travelling. [STURDY CONSTRUCTION & COMFORT HAND GRIPS] 1.13" diameter anodized, extruded aluminum construction ensures maximum strength and safety, supports up to 350lbs. And the textured rubber hand grips provides for a secure, nonslip grip while reducing hand pressure. 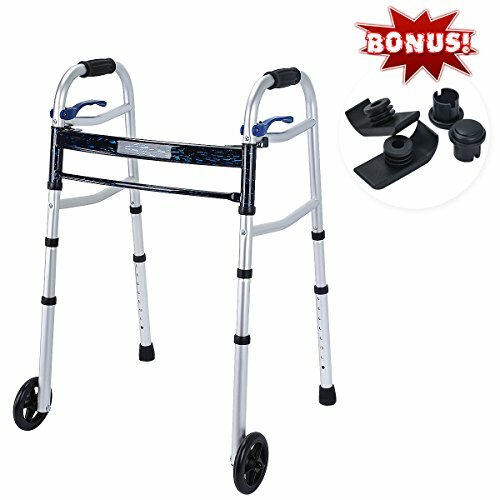 [GET 2 MORE PAIRS BONUS GLIDES, WORKS ON MOST TERRAINS] comes with 5 inch front wheels and 3 pairs of back glider caps (1 ski gliders included) to allow user to move and slide walker easily and smoothly over most surfaces. [FDA CE APPROVED WALKER, 100% AUTHENTICITY GUARANTEE] 30 days free money back guarantee, 60-day unconditional return policy and 5-year limited warranty. Please rest assured to buy! If you have any questions about this product by HEALTH LINE MASSAGE PRODUCTS, contact us by completing and submitting the form below. If you are looking for a specif part number, please include it with your message.